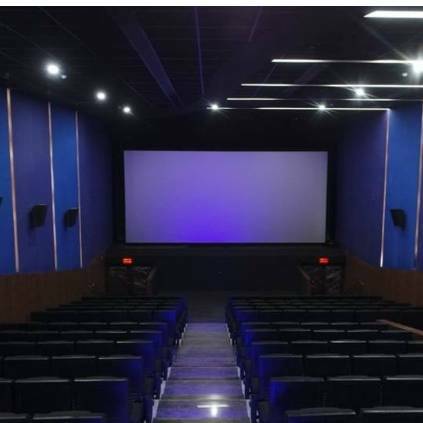 - A brand new theatre has been opened in KK Nagar in Chennai called 'Kasi Talkies'. It is a four-screen multiplex with Dolby Atmos technology. - Actor Atharvaa's next with director Sam Anton titled '100' is currently in the pipeline with Hansika Motwani playing the female lead. Now the team has officially announced that they have started dubbing for the project today. Looks like the film can soon be expected on the big screens. - It is now official that Bramma.com director, Purush Vijay Kumar is all set to start his next film titled Kangu. The project went on floors today followed by a small ritual conducted with the presence of the entire team. Atharvaa's action cop drama 100, directed by Darling fame Sam Anton, is done with the shoot, and just one more song is left to be shot. The film, also co-starring Hansika, has music by Sam.C.S. On this note, director Sam took to his Facebook page to thank his whole team for their support in completing this film. "Done with the shoot of #100 :) super journey thanks to my hero Atharvaa Murali bro and my producer Mahesh Anna Auraa Cinemas .. I have to thanks my cinematographer Krishnan Vasant for all his effort and hard work.. Thanks SamC S bro for the wonderful songs:) thanks to Umesh Kumar bro for the art design especially the control room .. my master Dhilip Subbarayan who made our film an action packed one .. I have to thanks my asst directors who worked day and night more than me .. shooting for 24 hrs contiously was not an easy task they nailed it ..
my associate directors #milesh #dennis my asst directors #naveen #ragul #dharma #mahesh #sundar #vinod .. we have done our best now it's time for our thala Livingston Antony Ruben to take over :) .. Will be a genre shift for me .. hope u guys like our work:)"
People looking for online information on Atharvaa, Hansika Motwani, Sam Anton will find this news story useful.